The thumb joint at the base of the thumb is the most mobile in the hand. The thumb can move up and down, in and out, and rotate slightly to touch the fingers. We move our thumbs hundreds of times each day. The thumb works as a grip when we use a hammer or hold a glass. The thumb also acts as a stabilizer to allow the fingers to manipulate items. We use such precision movements for counting coins and handwriting. Over time, all of the movement and pressure at the thumb joint can cause “wear and tear.” This can result in joint deterioration and arthritis for some individuals. When symptoms are not relieved by non-surgical methods, joint reconstructive surgery, called Arthroplasty, may be appropriate. The carpometacarpal (CMC) joint forms where the ends of the metacarpal bone at the base of the thumb and the trapezium bone in the wrist meet also called the basal joint. Smooth cartilage covers the ends of the metacarpal bone and trapezium bone. The cartilage allows the bones to glide easily during motion. Strong ligaments and muscles hold the CMC joint in position and provide stability. The most common cause of CMC joint breakdown is arthritis. It is more common in women after the age of 40. In particular, osteoarthritis can result from “wear and tear” at the joint. Osteoarthritis can cause the smooth cartilage to become rough. 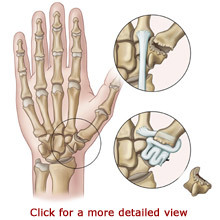 When this happens, the bones do not glide easily and moving the thumb may be difficult. In extreme cases, the protective cartilage padding at the ends of the bones may wear away. When the deteriorated joint moves, bone rubs upon bone causing pain, swelling, limited motion, and frequently causing a grinding or popping sensation. The most common symptoms of arthritis at the base of the thumb are pain, stiffness, and swelling. These symptoms may appear upon awakening in the morning and then lessen as the thumb “loosens up.” The pain is usually worsened when the joint is moved. The pain typically occurs during and after gripping and pinching activities, such as turning a doorknob, buttoning buttons, tying shoes, or holding a knife to cut vegetables. However, some individuals may experience pain even when they are resting. As the CMC joint begins to break down, it may become weaker and movement may be restricted. 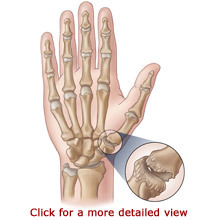 If arthritis causes the bones to shift, a “bump” can appear at the outside base of the thumb. Your doctor can diagnose arthritis and CMC joint deterioration by evaluating symptoms. Your physician will conduct a physical examination including examination of your hand and review of your activities, pain patterns, and history of the problem. Your doctor will order an X-ray to see the condition of your bones. When taking an X-ray, a camera focuses on your thumb area and takes a picture. The procedure is painless and simply requires that you remain very still. In the early stages, arthritis at the base of the thumb will respond to non-surgical treatments involving pain relief and rest. These generally include medications, cortisone injections and splinting. However, because arthritis is a degenerative and progressive disease, it may get worse over time for some individuals. When non-surgical treatments no longer provide relief, surgery may be recommended. Your doctor will discuss appropriate surgical options to help you decide what is best for you. There are several options for the surgical treatment for arthritis of the thumb CMC joint. One type of surgery, called CMC Arthroplasty, involves reconstructing the joint. The surgery may be done as an outpatient procedure or may require an overnight stay at the hospital. The individual may be sedated for surgery or remain alert with anesthesia that temporarily blocks the feeling in the hand. The surgeon has a few options for replacing the joint. The most common procedures involve stabilizing the metacarpal and using one's own tendon tissue as a joint spacer. In one procedure, the ends of the bones are fitted with a prosthetic implant. The surgeon makes an incision at the base of the thumb and carefully opens joint. The surgeon removes damage on the end of either bone, revealing new smooth surfaces. If using an implant with a stem attachment, the surgeon will create a small hole in the bone for placement. Finally, the new joint is reinforced using nearby tendons. In another joint replacement procedure called Spherical Implant Surgery, a small ceramic ball is placed between the ends of the bones to form a new joint. The surgeon removes the ends of the bones and creates an area for the ball to fit snuggly in the joint. The ball implant allows the bones to glide smoothly. Following surgery, the thumb is padded and a splint is applied to promote healing. You may experience some discomfort and swelling. Your doctor will recommend some pain medication to help. Keeping the hand elevated above your heart can also help relieve the symptoms. You can do this by placing your hand up on a stack of pillows while you are sitting or sleeping. Physical therapy or occupational therapy with a certified hand therapist is recommended for further casting or splinting. The therapists will work to help you regain motion, strength, and coordination at the CMC Joint. Full recovery from CMC Arthroplasty will take several months. Joint reconstruction usually requires a period of immobilization followed by therapy. Recovery typically takes up to three months for the prosthetic implant surgery. The casting period is longer as well. Recovery does not take as long for the Spherical Implant Surgery—individuals can return to full activity after three to five weeks. Most commonly, patients continue to improve for many months after surgery. With either surgery method, most individuals achieve good results and are able to use their thumbs with little or no pain.